The list of Merchant of Venice characters provide a convenient introduction to the William Shakespeare play summary of Merchant of Venice. The title character is the merchant Antonio. The character of Shylock has raised a debate over whether the play should be condemned as anti-semitic, and this controversy has overshadowed many other aspects of the play. The male and female characters bring the plot of the play to life. Not only do we remember the stories but we remember the people - we all have our favourite characters. The following short summary of Merchant of Venice provides a brief description of this famous William Shakespeare play. The story of the plot with its famous characters via the summary of Merchant of Venice. Interesting facts and information about the Globe Theatre of Elizabethan London with a William Shakespeare Play Summary of Merchant of Venice with a list of Characters. This drama is one of the great plays, classified as a comedy, by William Shakespeare. The plot involves a Shylock, a greedy Jewish money-lender. 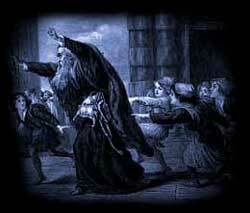 Shylock, has lost his beloved daughter when she elopes with a man who belongs to a virulently anti-Semitic society. Shylock seeks a literal 'pound of flesh' from the Merchant of Venice - Antonio when he fails to pay the debt. Portia, defends Antonio from Shylock's legal suit. Shylock ends by renouncing his faith and his fortune. Interesting Facts and information about the Summary of Merchant of Venice and Characters. Additional details, facts and information about the Globe Theatre and the summary and characters of other William Shakespeare plays can be accessed via the Globe Theatre Sitemap.